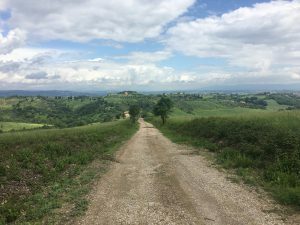 After the Monte Sibillini we were planning to head for the Apuan Alps, a small offshoot of the Apennines that sits behind the coast of northern Tuscany. It was going to be quite a drive and we wanted to break it up. Our first stop, the night we had Bertie’s brakes fixed, was a small sosta at Torrita di Siena. 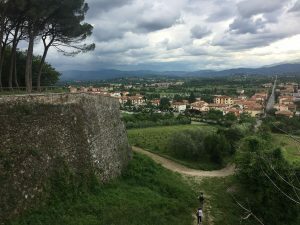 We sneaked into the remaining space (there were only half a dozen) alongside various nationalities and reminded ourselves of the beauty of the Tuscan countryside. 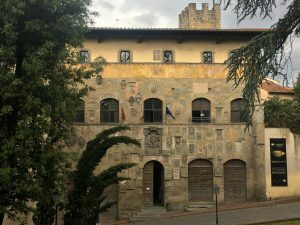 Tuscany had seemed so crinkled and hilly when we first drove through on our way south, but we had become used to the drama of mountain views and now it seemed like the green hills folded themselves gently around the golden stone of the local buildings. 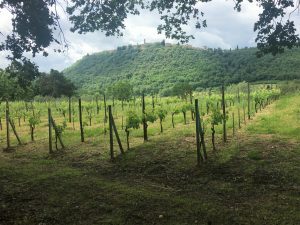 The sosta is on a walking and mountain biking (and horse riding if you happen to have bought your horse along) trail – the Sentiero di Vin Santo, so on the following morning we took our bikes out on the trail. Suddenly we were reminded that the pleasant folds of the countryside hid steep sided valleys. Our legs pumped as we ascended along the trail that should have ended at Montefollonico, a town on a hill, but as we got closer to the town we realised that we would have to navigate some very overgrown single track and then have an incredibly steep uphill final slog to Montefollonico. We looked at each other and decided without words that it was too hot to bother. We turned around and made a very swift return to Bertie. It was only mid morning, so we had a look at the map to see where we could go next. Somewhere we could wander round without too much exertion in the heat. 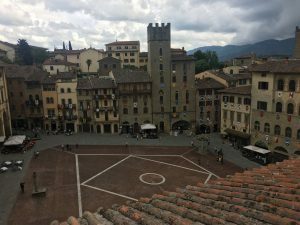 Arezzo was the perfect spot, a tourist town, but not too big. I sold it to Paul; ‘look, there are even escalators to get from the parking to the town’. We drove to Arezzo and easily found the very large motorhome parking area. There were no services here, but still some of the spaces seemed to be permanently occupied. We lunched in Bertie before setting off for the town, a very easy and gentle uphill walk. I have seen other places that are far more in need of an escalator than Arezzo. It was such a gentle walk that we decided we would look foolish using any assistance. The old town, within the city walls, was one of those Italian towns that was a pleasure to wander around, with narrow medieval streets and unexpected piazzas. The focal area is the Piazza Grande, rather unusually it slopes steeply from one side to the other, supposedly to allow the rain water to run off, although I’m not sure that’s a good enough reason for such an unusual design (but what do I know). 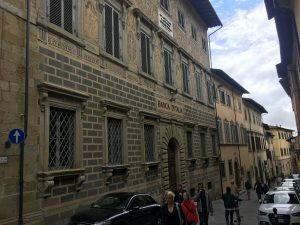 We mooched around the shaded side of the streets and then paid a few euros each to visit the Palazzo di Fraternita dei Laici. There is an art collection here which was worth a quick look, but really we had paid our money to climb to the top of the bell tower and see the views. 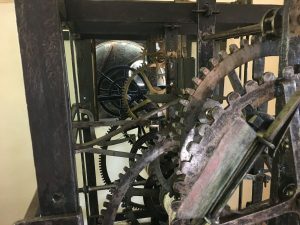 The tower has an interesting clock mechanism which you can watch as it strikes each quarter hour. We waited on top of the tower as thunder clouds started to gather and occasional fat spots of rain landed on us. The chiming of the bell was a bit of an anti-climax especially because it was the hour and so only one bell was in action. 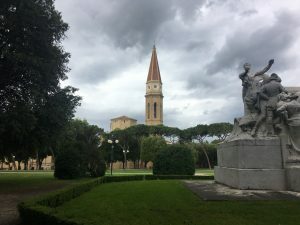 Arezzo is a place that you could take some time to explore, it is just the right side of touristy, meaning that there were plenty of cafes and shops open and a bustling atmosphere, but it was not mobbed with tourists. 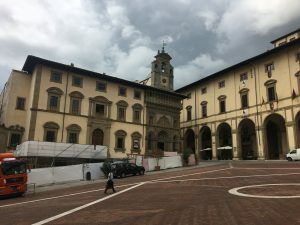 Unlike Florence which was to be our next stop, more about that in our next blog post.